BRASELTON, Ga. (Oct. 13, 2018) – Corvette Racing’s Antonio Garcia and Jan Magnussen won their second straight IMSA WeatherTech SportsCar Championship GT Le Mans (GTLM) Driver title Saturday, and in true Corvette Racing fashion it was a team effort. 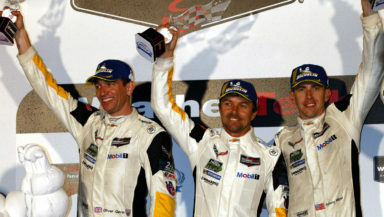 Oliver Gavin, Tommy Milner and Marcel Fässler placed second in class at Road Atlanta’s 10-hour Petit Le Mans in the No. 4 Mobil 1/SiriusXM Chevrolet Corvette C7.R to close Corvette Racing’s 20th season of competition in IMSA. Garcia, Magnussen and Fässler co-drove the No. 3 Corvette to an eighth-place finish – a result good enough to secure the GTLM Driver and Team championships. It is the 12th Driver Championship for Corvette Racing and 13th Team title in the program’s 20-year history. Both Corvettes showed race-winning pace throughout the day and into the night as both cars led multiple times in the 10 hours. But pitwork ultimately proved to play a huge role. The No. 4 pit crew got Milner out ahead of the No. 3 Corvette’s lone remaining championship contender on his final pit stop with 48 minutes to go. That was only half the story, however. The No. 3 Corvette crew needed just five-and-a-half minutes to repair its C7.R after a crash with Garcia at the wheel following a pit stop with less than three hours to go. Among other items, the crew replaced the Corvette’s nose, front fender and engine floor in lightning quick speed to keep the No. 3 C7.R in the race and in the championship hunt. At that point, the focus turned to the No. 4 Corvette. Gavin, Milner and Fässler – who drove both Corvette entries in the race – fought and clawed their way to a position where Milner could pressure the sister car’s championship challenger late. The team’s effort proved even more important as the No. 4 Corvette went from fifth to third in the final GTLM Driver and Team standings. Although Corvette Racing’s IMSA season is complete, there is one more race left in 2018. Corvette Racing will contest the FIA World Endurance Championship’s Six Hours of Shanghai on Nov. 16-18.